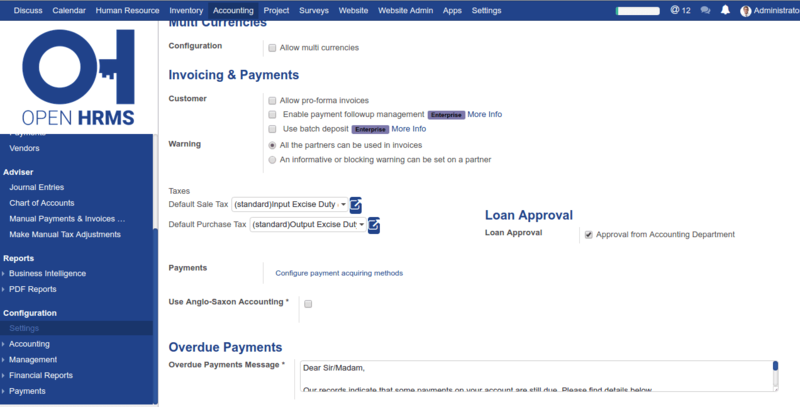 Open HRMS loan Management is a component of Open HRMS suit. 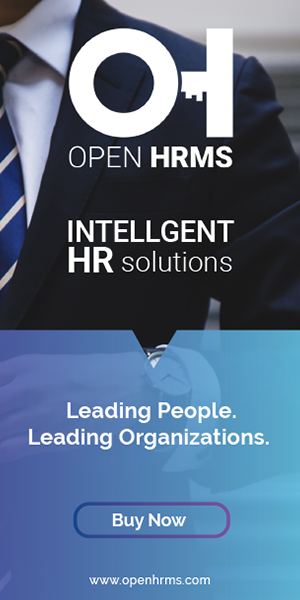 Open HRMS Loan module helps the user to configure different loan policies, assign approval authority, conduct verification process and sanction loans for employees. There may be situations where we want to give loans to our employees in order to ensure the employee's satisfaction. 1. An employee can create a loan request. 2. Double layer approval, from Accounting & HR Department. 3. Current month installment is automatically listed in payslip. 4. The loan amount is deducted from the salary. a. 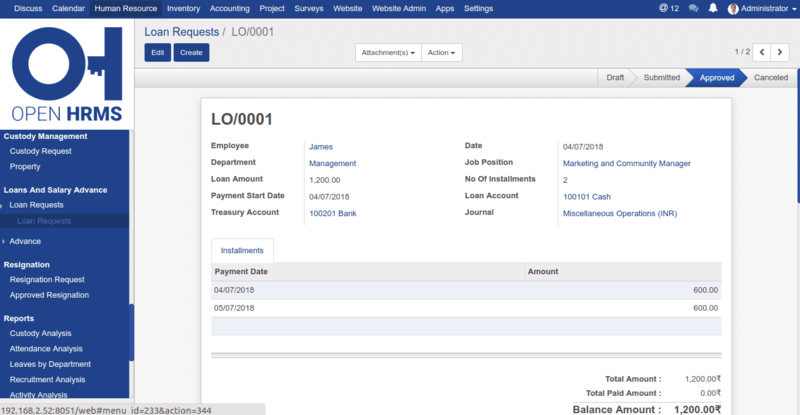 First of all, install the module Open HRMS Loan Accounting in order to enable accounting entries in Odoo for a loan. c. In loan management, we are creating a salary rule for a loan which is under the category deduction. Add the deduction rule for a loan in salary structure. When we add this rule the loan amount will be deducted from monthly salary. b. Create a loan request for the employee. Go to Human resource -> Loans and Salary Advance -> Loan Requests. An employee can create a loan request by adding the loan amount with payment start date and a number of installments. Once the loan request is submitted, the HR Manager acts next. c. When Hr manager sees the loan request he computes the installment lines and the loan amount. He makes sure the amount is equally divided among the number of installments and further the amount is deducted from employee salary on monthly basis. We can easily monitor the total amount, total paid amount and balance from the loan request itself and it will be very helpful for quick valuation. From the balance amount, we can see how much pending amount is there for the employee. d. Once HR approves the loan request, next the accounting department comes into action. The accounting officer provides necessary accounts for loans such as treasury accounts and loan accounts. He also validates the request and payment released for the employee. 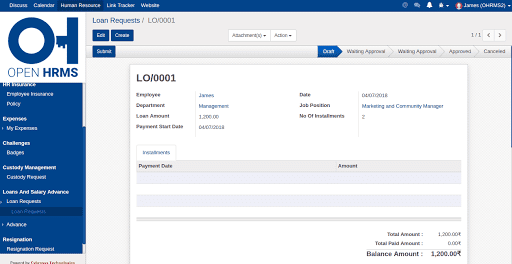 e. Create payslip for the employee for that Go to Human resource -> Payroll -> Employee Payslip. When we create payslip for the employee, the corresponding installment will be listed under the Other inputs of payslip and when we Compute the sheet the particular installment amount will be deducted from the salary. When we check the loan request we can see the installment of that particular month added as paid and outstanding loan amount in the loan request.